So, I finally joined Pinterest. I didn't have to get someone to send me an invite, just signed up and within 24 hours I had my invite. So if you've been hesitating because of the hassle, I think it's safe to join! My top "mood board" item for Fall is this Red Valentino dress, $695 from Saks. The dresses in this post are not necessarily items I would like to knock off, just items that inspire me. I love the simple shape of this dress that makes the most of all the textures involved. I can't quite tell, but it looks like a tweed bodice and skirt, with an organza overlay on the bodice, and lace sleeves. Opposing counsel wore a dress to a meeting this summer that used black organza over a black-on-white print to play with color and I loved the way it worked. I also like the bike-friendly full skirt! This is just the perfect up-to-date classic style, if that's not an oxymoron. No strange shapes, natural waistline, and a beautiful fit (not tight, not a paper bag)--some variation of this will always be wearable. But the mix of materials brings in the lace trend and the colorblocking trend in a subtle, wearable way that keeps the overall look fresh. It is entirely suitable for day but still brings a lot of personality to the table. I would wear this dress weekly if it were remotely in my budget, but it's not something I would attempt to make myself. The fabric is everything and I just don't have access to the same fabrics as the house of Valentino (and if I did the dress would not be significantly cheaper!). Another look that I have no intention of copying, it's more about the mood. I love the extravagant sleeves of this DVF Madeline dress, $345 from Nordstrom. These kind of sleeves are impractical in real life because they drag through the dishwater, get ink-stained from writing on note pads at work, and generally fall into your food. But with the unabashed red they just barely evoke the sumptuous textiles of Renaissance paintings without being too obvious and without being costumey. The overall impression is richness, saturation, and sumptuousness--but restrained by taste. The wrap dress is everywhere! I guess it never really goes out of style, but it is definitely in style now. I saw lots of classic wraps in jersey--no wonder Diane von Furstenburg wants to be able to copyright her fashion designs--but this silk woven Fendi, $1880 from Saks, really caught my eye. You know how much I love BurdaStyle 02-2009-123--I've made it three times. This is sort of a bolder version of that wrap blouse, with the shawl-type collar writ large and emphasized by the coordinating sheer. The style has so much movement that the normally bland neutral colors convey elegance rather than boringness. As a shortie with a proportional neck (that is, a short neck, though I don't look like my head is sitting on my shoulders), I generally avoid high-neck looks. I need some depth at the neckline to neutralize my shortness, and a small bust works best with a lower neckline so there aren't acres of fabric between the chin and the bust point. However, this Ralph Lauren Collection, $1898 from Saks, really speaks to me. I love the ruching, and the demure high neck does not look prudish or coy, but merely elegant. I think elegant is my theme here. I am glad to see the tie neck is still in style, like this Dolce & Gabbana, $2495 from Saks. For all I love frills and furbelows, I have only dipped into one pattern in this trend, the McCall 5708 Hilary Duff tie neck blouse (I've actually made another version of it; I need to show that sometime). Although I'm sure I'm coming in on the tail end of the trend, I have a tie neck dress on my sewing plan. My previous method for gathering inspiration was somewhat laborious, with screen captures, adding text, exporting to the my photo program, and then uploading to the web. Pinterest is a lot easier, though it's not 100% what I want. Ideally, I would be able to rearrange the pins on my board (please tell me if I'm missing something). I also find it hard to deal with the image posting code the service generates for blogging--it has a lot of extraneous code that doesn't play well with Blogger and must be massaged. I wish that the text you add on Pinterest would be added to the image for blogging purposes. And it can't capture flash images--Neiman Marcus is out. I've also had a not insignificant number of images disappear, never to be seen again--maybe 10% or more--so I have to go and re-pin them (the FAQ says to wait 24 hours for all images to populate, but a week later the images still hadn't populated). But all in all, so much easier. I've been creating boards like crazy. My main board right now is Fall Dresses 2011, with a subset for knit dresses in particular. I've also saved ideas for color blocking and directional stripes. I'm most proud of my RTW + Pattern board. Inspiration pieces plus patterns to achieve them, all matched up! That's where I wish I could rearrange the pictures, because the inspiration garment is not always next to the pattern. Can you guess which pattern works to re-create this fabulous Oscar de la Renta boucle dress, $1890 from Saks? The New York Times recently published an article on the monetization of fashion blogging, specifically, fashion bloggers getting agents. While there are a few sewing bloggers who make a living from their blogs, I don't think home-sewing clothing creators are in the same market as clothing consumers. Our looks are not as easily replicable and home-sewing lacks the prestige factor of a fashion blogger's high-end looks (even the fashion bloggers focused on the budget shopper eventually gravitate toward the aspirational, from what I've seen). People can look at a designer garment and "objectively" know that it is valuable. It's harder to do in sewing. You actually have to decide for yourself if you like a look! Workmanship is part of it, of course, but style is also a big component. That is where the magic happens, as they say. As for me, I cannot commodify my blog because it would violate the terms of employment in my real job. While it would be nice to get a little google ads mad money for fabric shopping, I actually like that the decision is made for me and I don't have to think about it. That said, I have no problem with bloggers who have found a way to turn their hard work (and it is work, no question about it) into financial remuneration. I had gone a while without ordering fabric from the internet--my last order was in July, knits from Fabric.com. But I opened one too many Fabric Mart emails, and they enticed me with their sale on ponte knits. They were doing a promotion for a free 10 yard bundle with a $75 order. It's amazing (or horrifying, depending on your perspective) how quickly you get to $75. While I definitely enjoy carefully selecting my fabric, dreaming up projects for them, the anticipation of waiting for them to arrive, there is something about a mystery bundle that is too much fun. I have no idea how they select and package their bundles, but the times I have received one it seems almost as though they look at my selected order and actually make an effort to give me fabrics I will use. And they did an excellent job here! The pick of the litter is the rayon print in cream, hot pink, and black. I immediately saw it as a pussybow blouse, and then I thought "Why make a blouse when you can have a dress?" I am hoping I have enough fabric to make the Cynthia Rowley Simplicity 2305 dress with a tie neck. The navy and green print is a polyester knit; you can't have too many of those. At least, I can't. The black fabric is a nice lightweight high quality glossy cotton. This was extremely fortuitous. 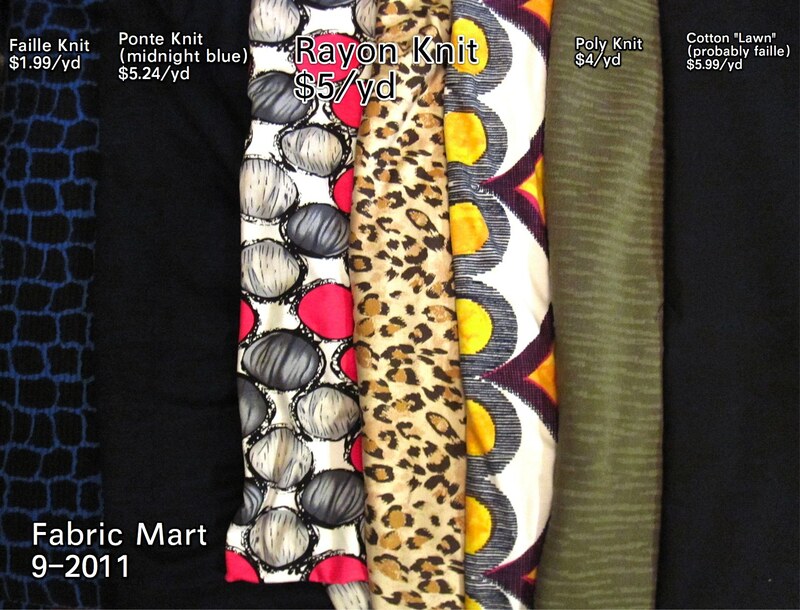 One of the items in my selected fabrics is a black cotton "lawn." I need a lightweight black cotton to make bias tape and for lining pieces where white batiste won't do. Well, the "lawn" is actually a heavy-weight faille; a wonderful fabric, but not at all suitable for the purpose for which I ordered it. The bundle fabric is exactly what I was looking for. The pastel print rayon is not my style and not great quality, but it will be perfect for muslining lightweight projects (maybe my sari silk?). The only thing I won't find a use for is the khaki/beige knit. It's a nice heavy knit and it appears to be pre-fused with a lightweight interfacing (in other words, the black side cannot be used as the public side). It would be perfect to make a waterfall cardigan or unstructured knit jacket. I do not wear brown, ever, and if I were ever to wear brown it would be rich brown, not khaki. This fabric is too close to the color of my skin. If you would like this beige/khaki knitfabric, sign up for the giveaway drawing in the comments. I'm limiting to US only; so sorry to my international readers but this heavy fabric would be quite expensive to ship internationally. As usual, you must have commented on my blog in the past six months to be eligible. And here is what I actually ordered. I love the faille knit in black with blue print. And such a steal at $1.99/yd! 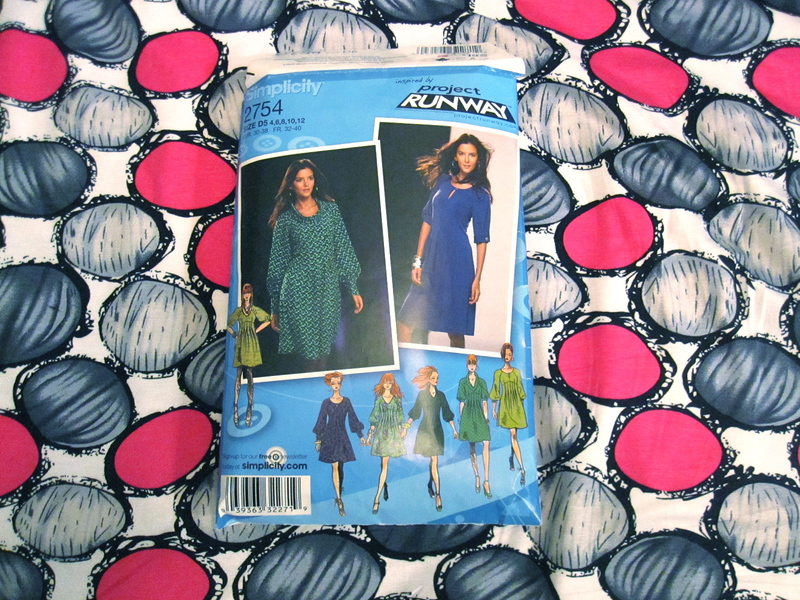 It is high on the list to make Butterick 5677 (on sale today for $1.88! ), the colorblock dress, with black. I was hoping the blue in the faille print would match the midnight blue ponte next to it, but they are completely different colors so no go there. LOVE the midnight ponte. I haven't decided what to do with it yet. Maybe Butterick 5559, the Maggy London with the pleats radiating from the side seam. I mentioned before that I passed my yellow and gray fan dress Simplicity 2754 on to the Goodwill, as it never stopped feeling like a nightgown to me. I liked the pattern a lot, though, so I got this pink and gray rayon knit fabric to replace it. The bad thing about new fabric is that it pushes planned projects to the back of the line. The good thing is that it is inspiring to sew up. So all that remains on this project is the hem. For my long awaited animal print dress, I will use Butterick 5672. I have high hopes for this pattern. It is a nice basic shape, but the pleats give it a little extra interest. This animal print rayon knit appears to be the same thing as the Style Studio Stretch Rayon I got from Fabric.com in July, as Fabric Mart had a different colorway of the print I got from Fabric.com in their selection. It is a nice weight and appears fairly stable (with a little bit of growing at the hem). I'm not sure it will totally work as a slinky number like this; it is stable but not the type of fabric that will stay highly fitted. We'll see. 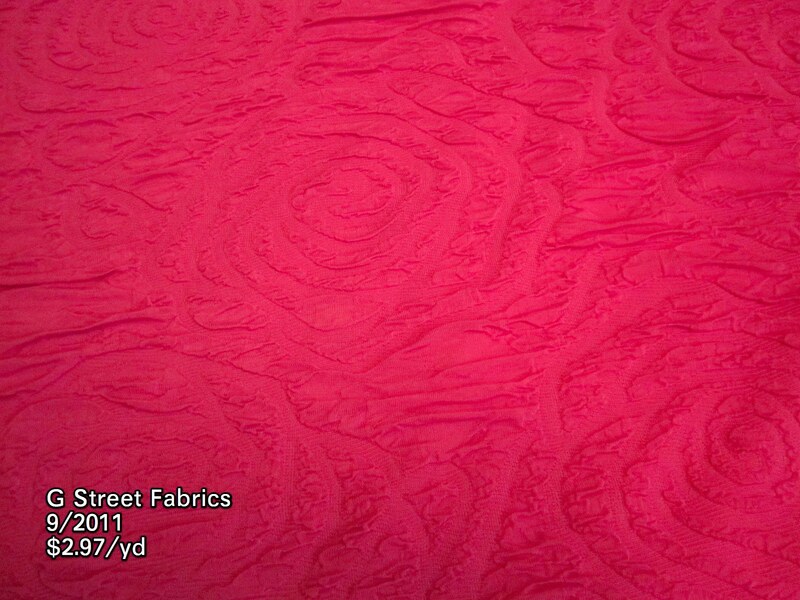 The next rayon knit print is to match some purple satin from G Street to make an outfit for my mom. I'm not sure she'll love the bright bold print, but I think it will be cute on her. The fairly unappealing olive textured knit is to underline the gorgeous olive sweaterknit I got from Golden D'Or in Dallas last Christmas. I wanted a similar color, not a flesh tone, to underline the sheer sweaterknit and this is the first time I've found something that will work. I have been puzzling over the content of that sweater knit, btw. It burns to a hard plastic bead, but the smoke isn't thick and curling and it doesn't smell like poly. I pre-washed it by hand and when wet it is clear there is some wool in it. Woot! I think it is a wool/nylon blend, but no guess on percentages. I am kicking myself for not getting some of the hot pink, too! The last is the cotton "lawn," which, as noted above, I speculate is really faille. As far as I know, lawn is a smooth, lightweight weave. This fabric is quite heavy (bottomweight at the least; it would be hard to wear as a dress), ribbed along the cross-grain, and has a sheen that made me suspect that it was actually poly--I was pleasantly surprised when the burn test said all cotton. I don't wear a lot of black. I think it looks good on me, but when I'm reaching for something to wear I am almost never in the mood for darkness. So I was contemplating whether to keep this. However, I think it would make a spectacular less-than-formal suit with a Chanel-style jacket. I don't see myself doing the full Chanel treatment, but I have McCall 6041 and it gets good reviews on PR. I will not, however, be "making it crafty." I see black-on-black grosgrain ribbon trim for this. Very chic. I have been doing some snoop shopping for Fall! I can't wait to talk about all my ideas (in addition to these--my sewing time delusion is going strong). What's appealing to you right now? Thank you for the advice on the project that reveals itself to be a fail midway! I ended up finishing the dress. Love the style, and it was good to make this "muslin," which showed me a few needed fitting tweaks. I will try to take photos this weekend and show it to you next week. I scored this beautiful Anna Sui silk at PR Weekend Philly last year during our trip to London Textiles. If you recall, we went bin diving into their huge stash of remnants. Silks were $5/yd, everything else was $3/yd. There was a touch over a yard of this fabric, so I paid $5 for it. I have since seen it pop up a few times in places like Vogue Fabrics and Fabric.com, for around $12.99/yd. Score! The fabric's selvage says Anna Sui (copyright 2006) so I went hunting in her collections around that date and found this look in the Fall 2007 RTW collection. Frankly, I like my use of the fabric better! 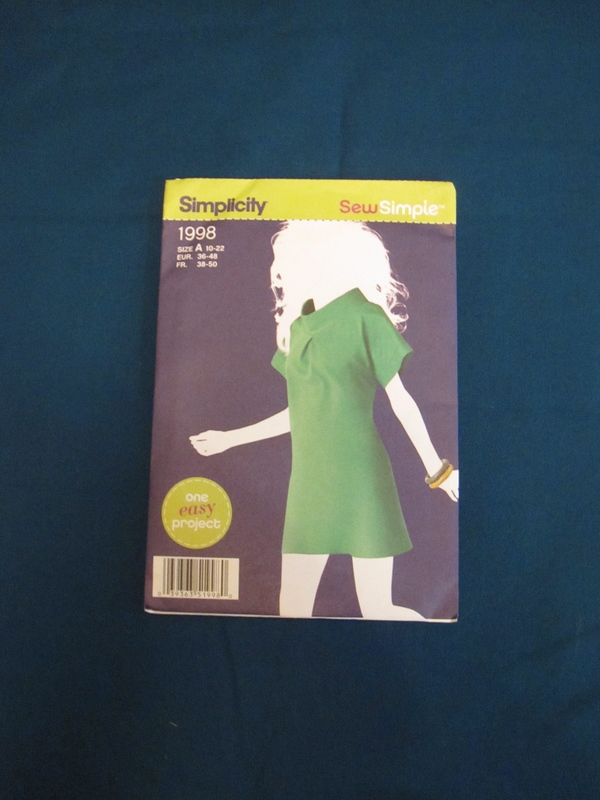 When I bought this, I was planning to make another Simplicity 2938 pleat neck tank for wearing under a suit jacket. Although the print contains two of my favorite colors--turquoise and hot pink--somehow it looks very subdued and I wasn't sure I'd love the finished item. However, when I pulled out the fabric to make it (I decided in the Spring that the next time the serger was threaded in black I'd make the top first thing so I could at least cross one thing off my sewing list--I do not sew a lot of black! ), the first thing I noticed is that it takes a little looking to tell the right side from the wrong side. I started thinking if there was a way I could take advantage of that, and remembered that when I made Simplicity 2360 the first time, in the green poly charmeuse fabric from Spain, I thought it would make a lovely top. So I scrapped my sensible plan for a suit-suitable shell and went with fun (are you at all surprised?). It is fun that is still in fashion, at least! I saw several variations on it during my recent snoop shopping forays, including this Julie Dillon dress for $138 from Nordstrom. I did not change much on this go-round with the pattern. 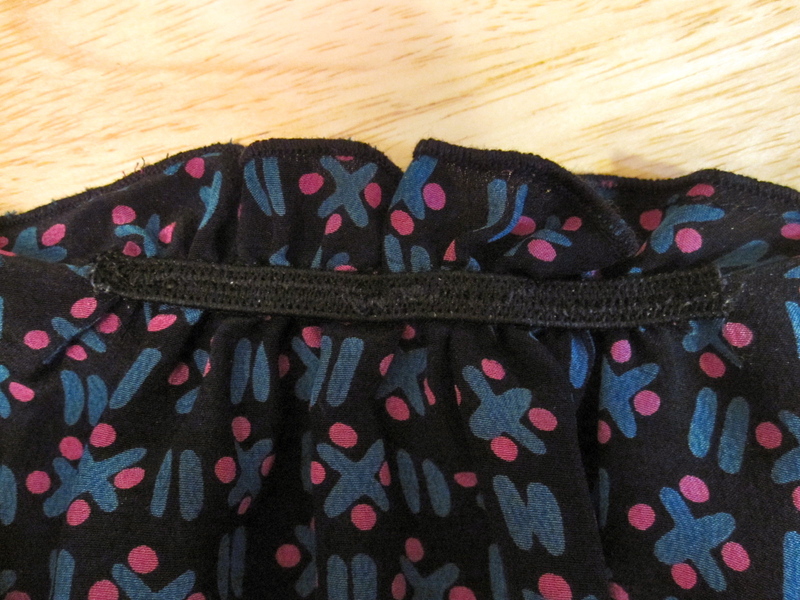 Instead of a drawstring, as I did for the dress and later regretted, I went with the pattern and turned the waist seam allowance into a casing. When I made the dress, I thought that I might want to lengthen the upper bodice pieces to move the waist seam down around an inch or so to my natural waist. When making this iteration I put on the dress and considered it, but then decided to keep it as drafted. When it was complete I wished I had lowered the waist. The top looks great with skirts, but does not work with skinny jeans *at all* because the waist is too high. I was hoping it would be a good top for jeans. Now I have to make yet another! 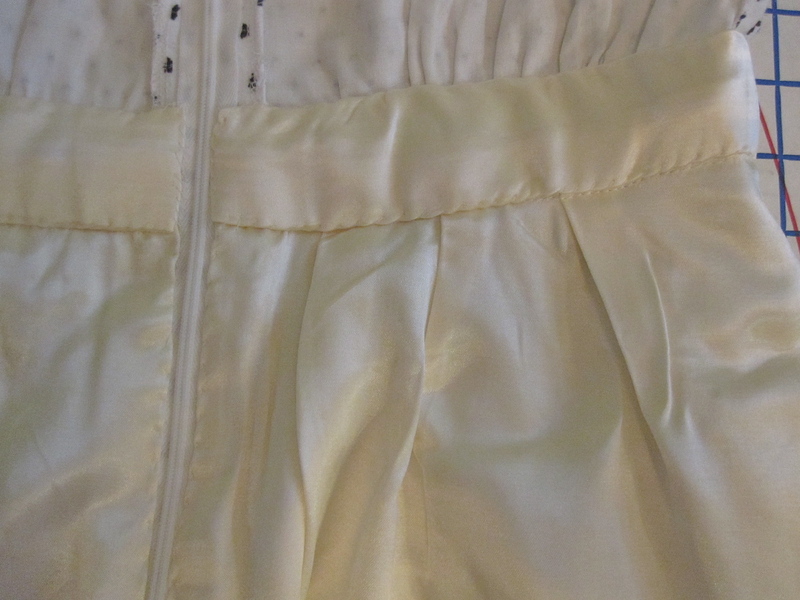 The waist seam is the only exposed seam; for the rest I used French seams. When it came to finish the neckline I had two problems. 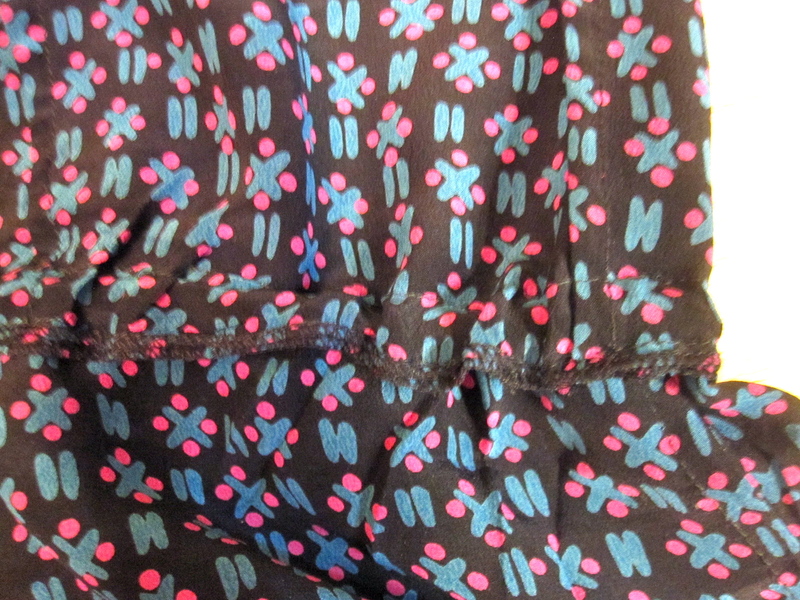 First, there wasn't enough fabric left to cut a bias binding, even a pieced bias binding. And second, it was too wide. I knew it was too wide from making the dress, but somehow didn't think to fix it before cutting. I actually (gasp) stay-stitched the neckline to keep it from stretching out. I finished the ruffle with a serger rolled hem, as before. I also used it to finish the armscye edges. Then I got the crazy idea to use it for the neckline and then gather the neckline somehow. I liked this little gathery ruffle feature in Burda 12-2010-105 as drafted (I ended up turning the ruffle under some picot elastic because my fabric was too floppy) so that's where I went. I serger rolled the neckline close the staystitching. I always lift the knife when I'm doing a rolled hem on the serger; I find I can't get the fabric to stay on the stitch finger if the knife is engaged. Then I found center front and measured 3 inches on either side of it, cut the shortest length of elastic that would stretch six inches, and then zizagged it in place while stretching. Love this feature! It totally looks intentional, and not a way to hide my bra straps. Love this top! 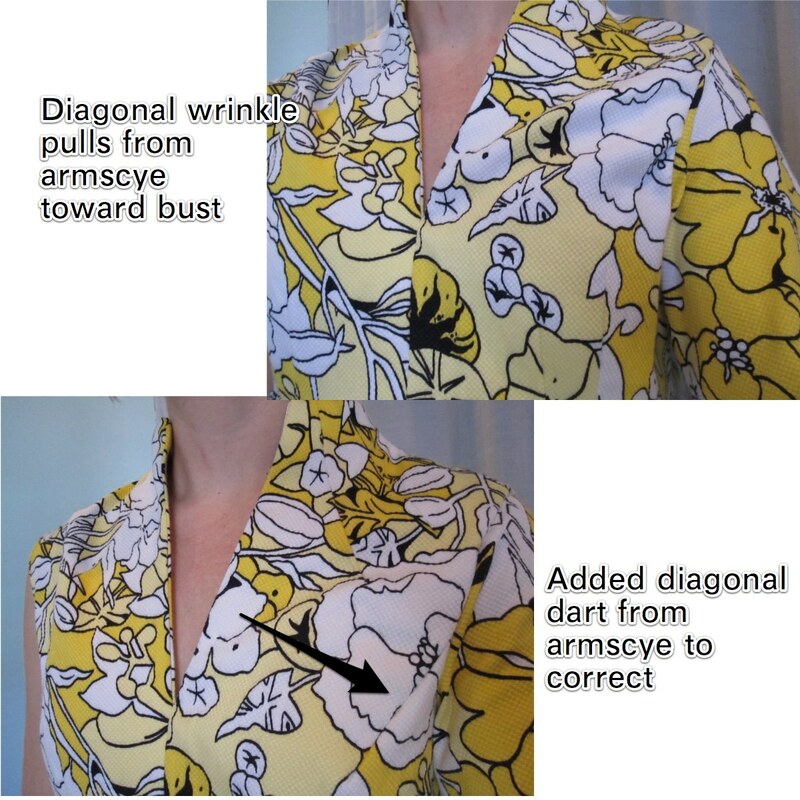 The pattern definitely works for a blouse, with the caveat about lengthening the upper bodice, as mentioned above, if you want to wear it with pants. I originally thought this top could be added to my Endless Combination wardrobe from last Fall as a match for my Burda 01-2009-112 hot pink corset waist pencil skirt given that the print has hot pink in it. But the hot pink in the top is so subdued that it is not strong enough to counterbalance the flourescence of the skirt. However, it goes with several other items in the closet (the most tame and predictable being the black skirt I paired it with here). There is one crazy outfit I am looking forward to wearing in cool weather. Cidell will not approve. I would like to see what this pattern looks like with the longer sleeves. They are cut-on dolman sleeves, so it could be cute or sloppy. Nobody else has made it that way (that I can find), which certainly gives me pause! But I can envision another one of these in the closet, if the right fabric presents itself. 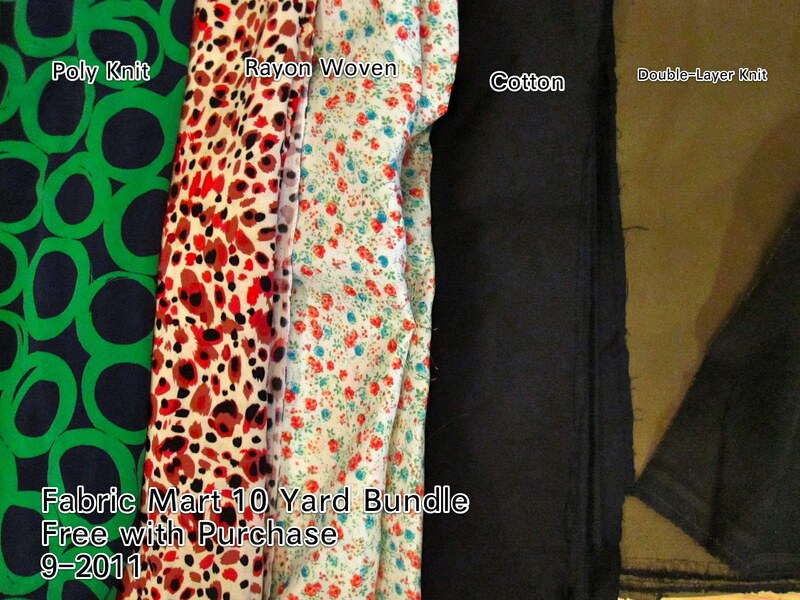 Not that I can do any more fabric shopping, given my recent escapade on Fabric Mart's website (details forthcoming). On the sewing machine right now is a dress that I know I won't wear. I realized halfway through this project that the color is terrible on me. The fabric is a seersucker type denimish with tiny stripes of white, dark gray, and red. These colors individually look fine on me, but their overall effect from a few feet away is a pinkish-blue that is very similar in hue to my skin tone, several shades darker. I look like putty in it. I debated whether to just stop and throw it away, or finish it to wear a couple times and then donate. My enviroguilt stopped me from throwing it away. I am trying to finish the remainder of it with dispatch, taking shortcuts here and there, but it is still driving me crazy. What is your strategy in this situation? Just toss? How do I talk myself into that? Thanks to all for the info on your Bernina walking feet in response to my difficulty with it. I tried oiling the needle bar and the foot bar, per Jne4sl's excellent suggestion, but it made no difference. I think I need to face up to putting my machine in the spa and living without it for a while. I'm not sure I *can* live without it! I have been trying to devise projects that can be done entirely on the serger, and/or contemplating actually using my treadle as a sewing machine instead of decoration. I was talking to my mom a couple of months ago and mentioned that I had decided on my birthday present to myself this year: a walking foot for my Bernina. I am one of four and my parents now have 7 grandchildren; we have never been wealthy so big presents just are not a thing in my family. I was just prattling, definitely not angling, but she got all excited and said she wanted to get it for me! It is true that I am hard to shop for. I don't want much (except fabric...) and what I do want I can easily get for myself. She was thrilled to have a solid gift idea of something I would love and use often. A big package arrived around my birthday, containing not only my Bernina Foot #50, Triple Soled Walking foot (WARNING: a video auto-launches if you click the link; turn the sound off), but also a couple of books and some home-grown and dried herbs. I had occasion to put it to use right away, sewing on the shiny side of satin. It was fairly easy to set up on the machine and worked extremely well. However, I would love information from those of you have a Bernina and use a walking foot. It made the machine "heavy" and tight--I could definitely feel the machine struggling to keep the needle bar moving and when I used the hand-wheel it was quite hard to turn. Any ideas what I am doing wrong? Or is this normal? I think it can't be normal because I couldn't have sewn much longer with the walking foot on or the machine would have completely frozen up. It took a little while to recover after I returned to a normal foot; the tightness did not immediately release when I took off the walking foot. I mentioned last month that I participated in the Dandies and Quaintrelles Full Moon Ride (if you click on the link, you'll see that I made the collage of photos!). This month was the last of the season. The theme is "White Nights" and you dress up in white or light-colored clothing. D&Q rides are all about the vintage fashion, so you can really do it up without looking ridiculous. It had a lot of dark discolored stains on both the lace and underlay and nothing I'd tried had lightened them, but I couldn't bring myself to the rid of the dress. Since I last tried to treat the stains, OxyClean has come on to the scene. 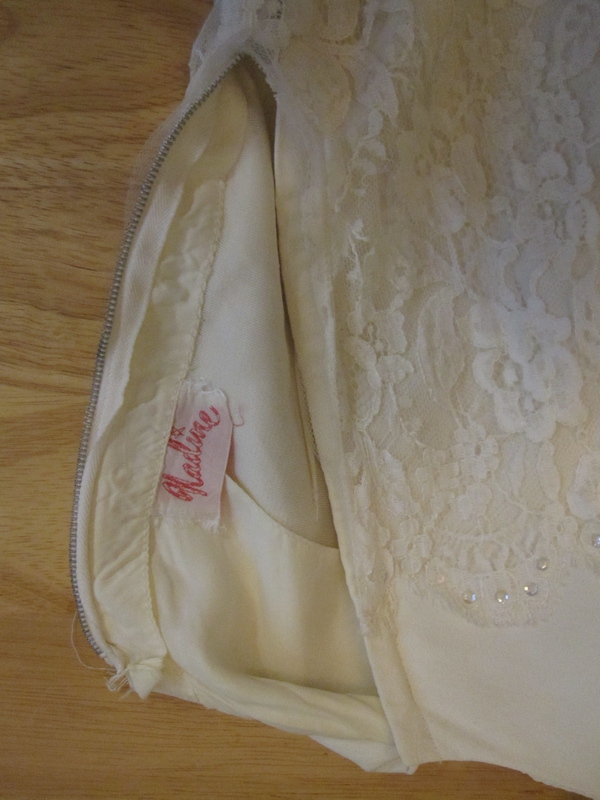 I figured I had nothing to lose, as the dress was unwearable, and soaked the lace in OxyClean for several hours. Amazing! I didn't take photos of the stains on the lace beforehand, unfortunately, but here is an example of a stain on the sheath underneath. The sheath did not respond as well to the OxyClean, but still showed some lightening of the discoloration. 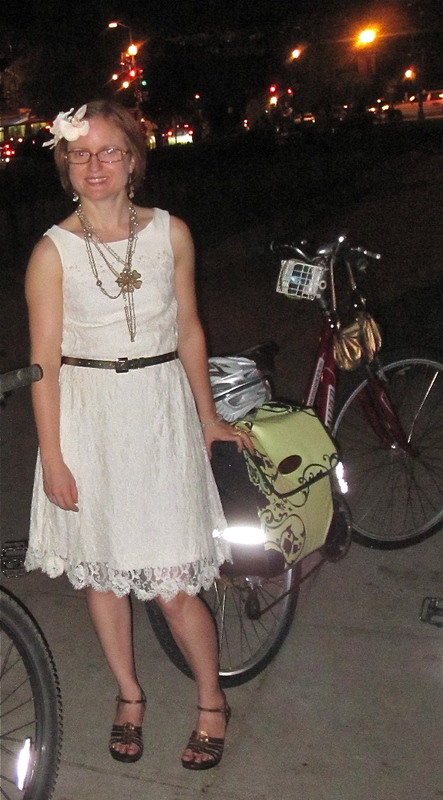 The dress is still not fit for prime time, I don't think, but was definitely wearable for a night-time bike ride. I was entirely thrilled about the dress. Then I put it on. Hmmm. I recall it fitting like a glove when I was a freshman in college. Although I managed to zip it up this time, I was a little concerned about getting out of it. One of the hazards of living alone is that your only option for getting out of too small clothes is calling the fire department! As it turns out, I am somewhat larger than I was as a (under 100 pounds) freshman. Even if it had fit, however, it would have been impossible to bike in, as the sheath was, ahem, very tightly fitted. To those of you for whom vintage is sacred: You should probably click away. Though to be fair, I was not the first to change up this dress. I am almost certain that it was once full length, very Jackie O. in Camelot (she loved long white dresses). When I got it, the sheath had been very roughly chopped off and I believe was hanging raw and much longer than the lace. The person had taken the trim off the hem of the lace, shortened the lace (albeit somewhat unevenly, as I discovered when hemming the sheath), and sewn the trim back on. So I don't know what happened when they got to the sheath. At any rate, when I went back in to alter this, I realized I must have altered it when I first got it to let it out at the waist a bit. Even when I was teeny weeny this was too small for me (perhaps a girdle is the difference). 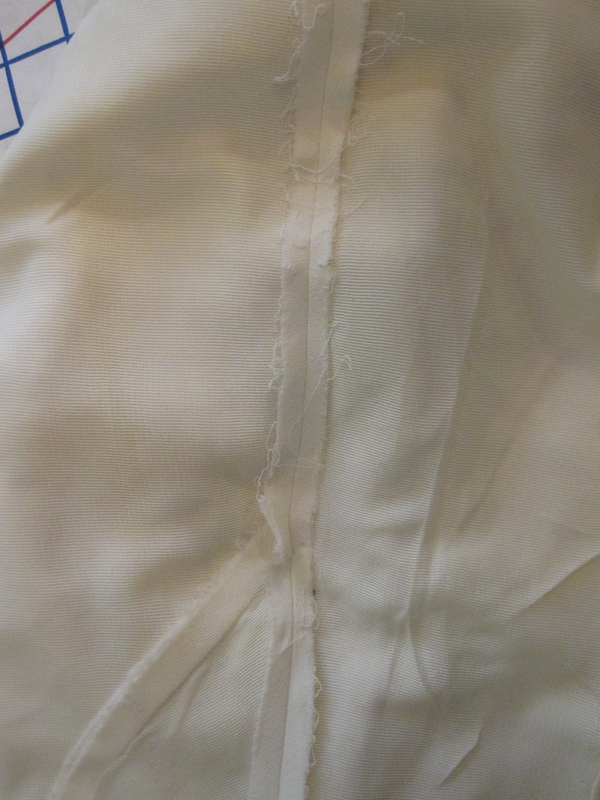 The photo shows the narrowed seam allowance where I let it out before. This time I undid the hem (which I had put in, somewhat badly, nearly 20 years ago) and then unpicked the side seams to within 2 inches of the underam. I drafted a side insert panel that would give me the maximum amount of body movement for biking, though I narrowed it after I took this picture and thought to measure the maximum width of the lace. No point in having extra, unusable volume in the sheath! The sheath fabric is a polyester crepe underlined with some sort of tricot, otherwise unlined. The fabric edges were left raw. After the Oxy Clean soaking and air dry the sheath part seems to have shrunk a bit while the tricot did not. So I had to do a little smoothing in my sewing. I sewed the matte side of my rayon satin as the outside; I didn't want the panels to shine through the lace and advertise that I needed more room! The color match is amazingly almost perfect, and the panels are completely unnoticeable in the wearing. The shiny side of the fabric is on the inside. Since I was sewing on the shiny side as the "wrong" side, I used to the walking foot to keep the satin from sliding around and feeding unevenly. It was perfect (aside from the machine tightening up, as mentioned above)! Finally, I was ready to ride! Here is proof of how unphotogenic I am. The photo was taken by a friend who is very photogenic; those people do not understand that you can't take one picture and call it good! It was another lovely ride through city (don't worry, I wore my helmet while on the road). This was the last Full Moon Ride of the season and seemingly hundreds of people showed up! Our caravan was about five minutes long and the passersby kept asking us what we were about. We ended back at Logan Circle again for a lovely impromptu party. Now the next thing we have to look forward to is the Tweed Ride. I can't wait! You MUST check out this awesome YouTube video. It condenses 100 years of fashion into an amazing 100 seconds. Apparently it's an ad for a shopping complex in London. I blame Amanda S. for this purchase from G Street Fabrics. She recently made a top out of textured fabric and I liked the way it jazzed up a simple design. This is a fairly bright orchid color with a crinkled top layer that forms roses. I'm wondering if this might be good for a simple cowl dress. Lynn Mally asked on my Swiss dot birthday dress post if I have ditched the Danskos for pretty shoes. Ha! You can pry my Danskos off my cold dead feet. If you see me in heels, you can be sure that I have worn them no further than to walk over to the camera to hit the self-timer button. I did take those pink flowered shoes with me (Borns, so as comfortable as heels can be) to my birthday happy hour, and put them on when I was assured I would have a seat. Amber Elayne asked on the same post if I had trouble moving the zip to the back of the dress. None! It worked perfectly. So much better than the side zip. As noted in the post, do not run the zipper all the way up to the back neckline. 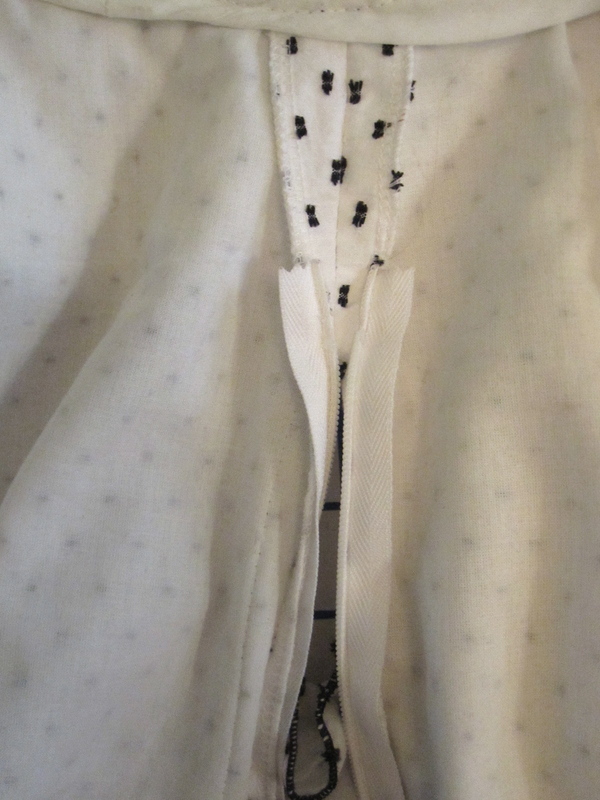 Sew the center back seam from the neckline down about 2 inches and install the zipper from there. That way you don't interrupt the ruffle. Beth Conky said on my planning for Fall post: Girl, you need to move to Texas. We have 10 seconds of winter and a good six months of summer. You'd be the happiest girl in Texas. Ha! My family lives in Texas and I spent a total of 7 years there. Even though it gets really hot and sometimes it's too much, I never took for granted that it doesn't get too cold for too long. If DC could be transplanted to a warmer clime, I'd go for it in a heartbeat. The Kitchenaid Ice Cream Maker Attachment is quite a success! I need to find a go-to ice cream base recipe. I did well with the Jeni's Splendid base from the Washington Post on my first batch, but the second batch had a bad texture. I suspect this is because I only rested the base until it cooled. I think it really needs to rest overnight to get all the air bubbles whipped in with the whisk to release. Also, my first batch was sort of a hybrid and included egg yolks, which might be a difference. Most recently I made Fig Honey Mascarpone Gelato from the LA Times and it came out very well. When I saw Vogue 8633 it was love at first sight. I bought the pattern last March and was in a feverish hunt for the right fabric for months. I finally found at PR Weekend Montreal, this stretch yellow pique from Goodman for $5/meter. So if I found the fabric in June of last year, why did it take me until almost the end of the next summer to make it? Who knows. So many projects, so little time! I started with my usual litany of adjustments. First, the swayback adjustment. I split it between the midriff piece and the skirt. During construction I ended up shortening the bodice back as well, as it was dipping low at the center. I was somewhat surprised by this, as the bodice back is well above natural waist and my swayback starts immediately below natural waist. But I got a great fit so I won't question it. The small bust adjustment gave me a little pause. On a standard darted bodice the adjustment is quite easy: narrow the dart. Here there are two vertical darts as well as two neck darts to create shaping. The neck darts and the second vertical dart are quite small, so I decided just to narrow the large vertical dart. I got a good fit at the bust here, so I appear to have made the right decision. I also did my usual Broad Back Adjustment. 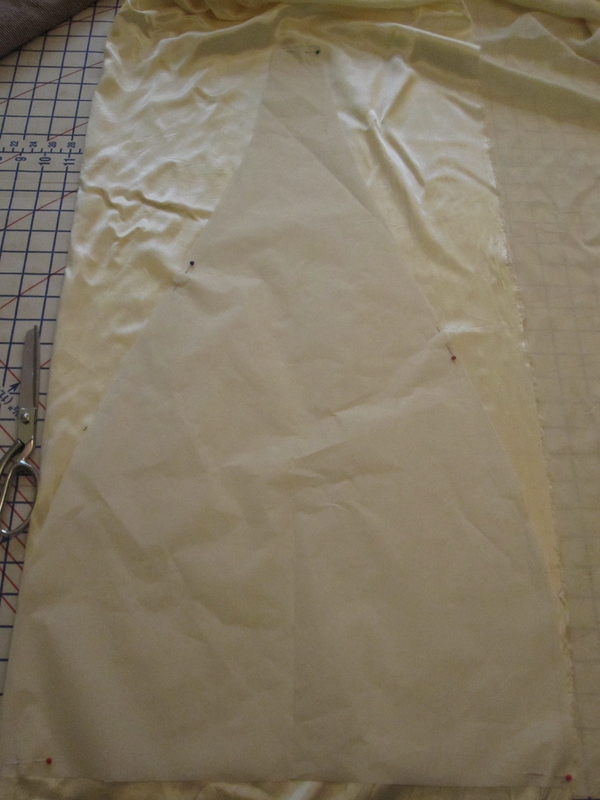 To make sure that the cut on collar stands up properly, I interfaced the upper edge of the fashion fabric in addition to interfacing the facing. I finished the edges of the facing using the interfacing stitch-and-flip method. I am addicted to this! This pattern can be made with a little cut-on cap sleeve or with a full sleeve. However, the set-in sleeve is set into the dropped cap sleeve. I am just not a fan of the dropped shoulder. 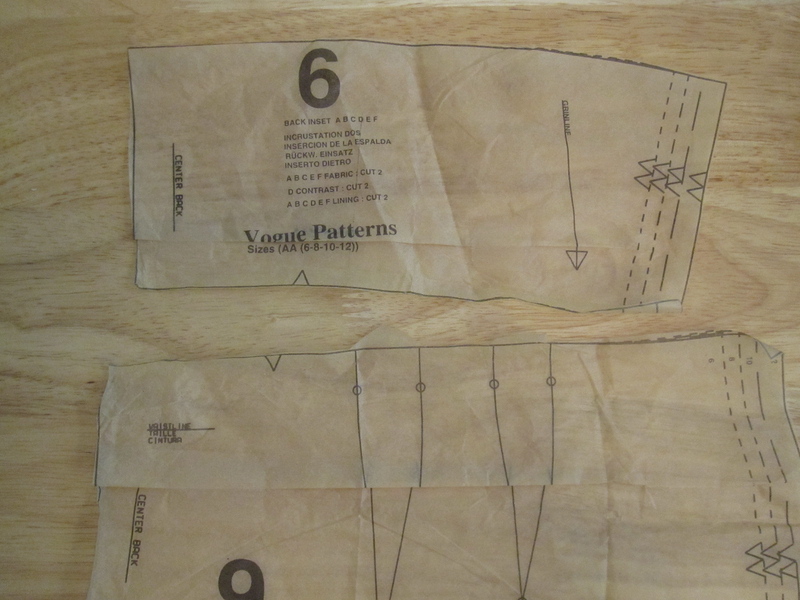 I considered actually being methodical and tracing a regular armscye onto the Vogue pattern. But it seemed to hard. 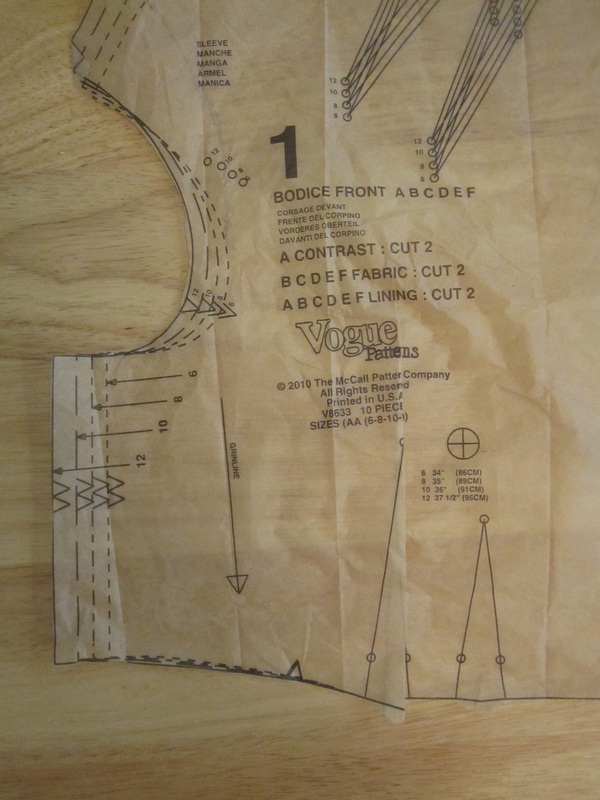 So when the bodice was constructed I marked my shoulder line and cut off the cut-on sleeve extension. The I used the sleeve from Butterick 5321 and set it in. Disaster! Huge diagonal wrinkles radiated from the armscye toward the bust. They were awful. I spent a lot of time trying to figure out how to deal with it, and ended up taking out the sleeve and making a diagonal dart from the armscye toward the bust to try to take up the fabric that was wrinkling. The end result is not perfect, but it is much better than it was without the dart. I don't know if the wrinkling came from my haphazard creation of a set-in sleeve armscye or if it was a fit issue with the pattern as drafted. It's not something I recall encountering before. Perhaps related (or not), the neckline and shoulders fall to the back on me. If I made this again I would probably need to figure out how to rotate that shoulder seam a little forward. It does not sit squarely on top of my shoulder; it's about 1/4 inch behind the shoulder line. I don't know if that would help the back neckline stay against the neck rather than pulling back or not. 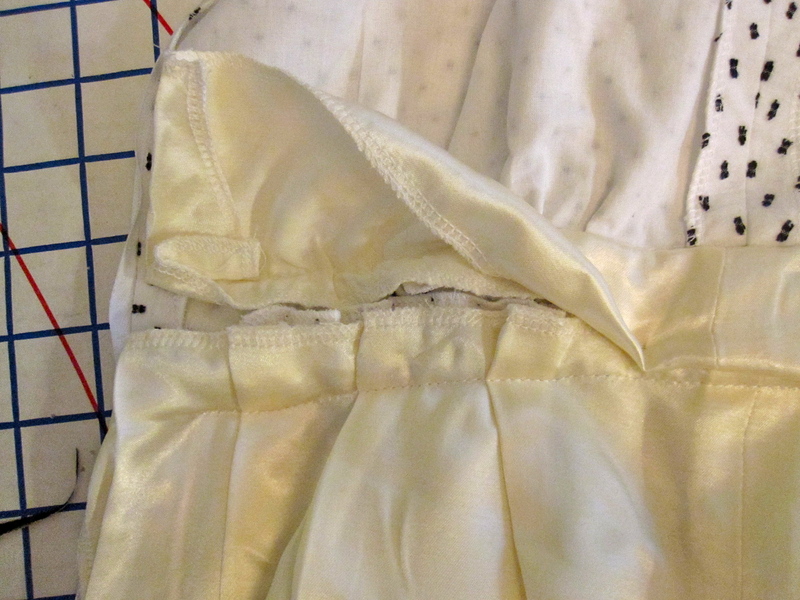 I also had to hand-stitch the neckline slit closed about 1.25 inches higher than marked. This is quite low as drafted. I used a mix of linings on this project. I left the bodice unlined and just used the facing, for breathability. However, I see this dress transitioning into Fall so I wanted a slippery lining in the midriff and skirt so it won't stick to tights. For the midriff, I used a stretchy nylon, to preserve maximum stretch at the most fitted part of the dress. For the skirt I used a stretch poly I purchased from Fashion Fabrics Club last year for $5.25/yd. Because I am short, I always have to shorten dresses and skirts by a lot, especially in the Big 4. I took out about 1.5 inches of length in cutting this dress. Imagine my surprise when it turned out a little short! Well, not short, but the raw lower edge was about the length I wanted the final product to be. 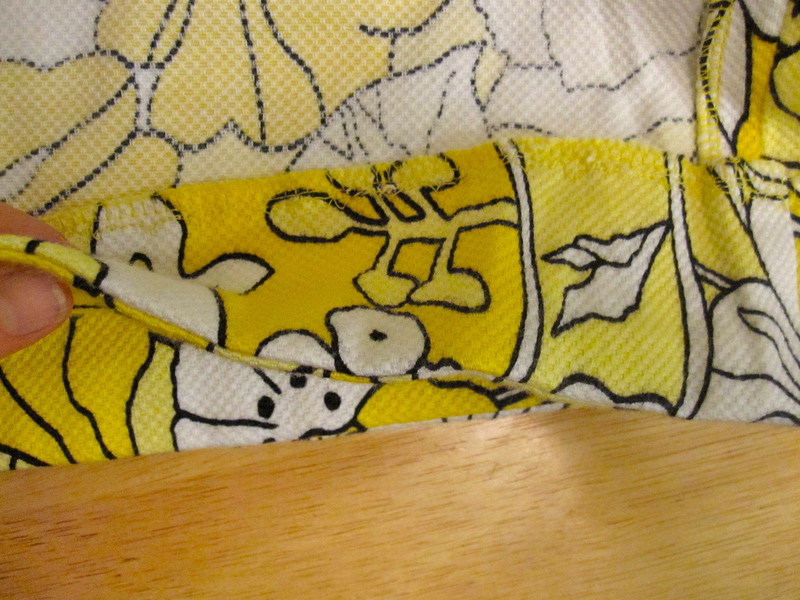 I finished the hem with a facing, and sewed it to the hem edge with a teeny seam allowance. I then used a machine blind stitch to turn up the facing. This dress was a long time in the making, both in contemplation and in actual sewing time. It was on the machine for about three weeks, mostly because I was busy during that time but also because the shoulders/armscye/sleeve gave me so much trouble. It was one of those pieces that has to go in the magic closet for a while so I stopped thinking only about those diagonal wrinkles, the misplaced shoulder, and the lack of balance of the dark yellow flowers on each side. However, once it did its time, I was thrilled when it re-emerged. It's a very flattering dress for me and I love the sunny yellow color. I envisioned it as a work dress on dress-up days when I am meeting with outside counsel, but unfortunately the cut-on collar does not play well with a jacket. So I'll just wear it on days when I need a little pick-me-up. The pattern is supposedly drafted for knits, but I had no trouble fitting it (in my usual size) in a stretchy woven. I don't think I would need to size up even for a non-stretch woven. I bought this swiss dot fabric from Kashi at Metro Textiles in NYC two years ago for $5/yd. Although it wasn't expensive, for some reason it had almost become too good to use. I just think it is so darling. However, of all my fabrics, a swiss dot is one of the most replaceable and I confirmed that it is available online--and even for around the price I paid for it when I looked a couple of months ago--and decided I needed to challenge myself to come up with a project. I made this Cynthia Rowley dress, Simplicity 2497, last year in fancy fabric for a wedding. 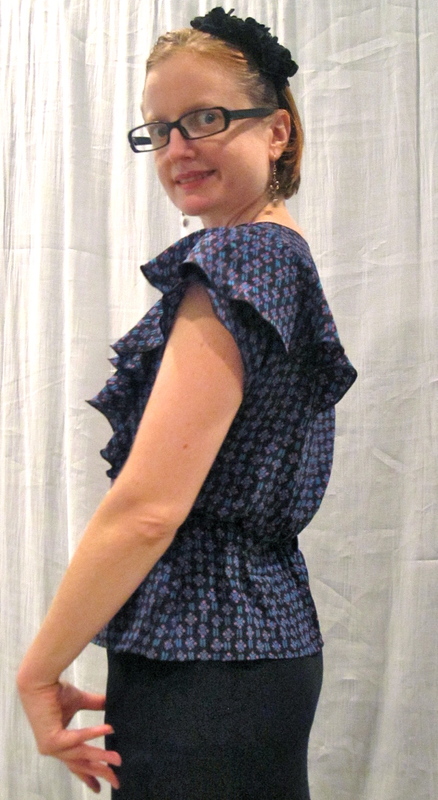 I was very happy with it, other than the way-too-low neckline and bulgey side zip, but didn't have plans to make another...until I took a closer look at Meli88a's seersucker version and saw what a cute casual dress this makes. So I put the project on my project list and didn't give it too much more thought. Until, that is, I realized it was a week to my birthday and I had nothing to wear! I mean, of course I could re-wear one of the millions of pretty dresses in my closet, but I love having a new birthday dress each year. The serger was threaded in white, I evaluated my project list in terms of what could get done quickly but still be festive, and this project emerged the winner. Not a very glamorous way to choose a birthday dress, but I love the result! The weave of the swiss dots is horizontal from selvage to selvage. As this is a voluminous dress, I didn't want to increase my perceived width with sideways stripes, so I cut on the cross grain (except for the midriff piece, so it would act as a "belt"). I didn't have enough fabric to cut the giant collar on the bias as directed, but as the cotton batiste fabric is very lightweight I wasn't concerned about drape. In fact, I was afraid there would be too much drape, so I backed the fashion fabric with a slightly narrower collar (cut on cross grain as well) cut of silk organza, which incidentally takes a serger rolled hem like a dream. This is a puffy collar, to be sure! The organza definitely makes sure it stands up straight. 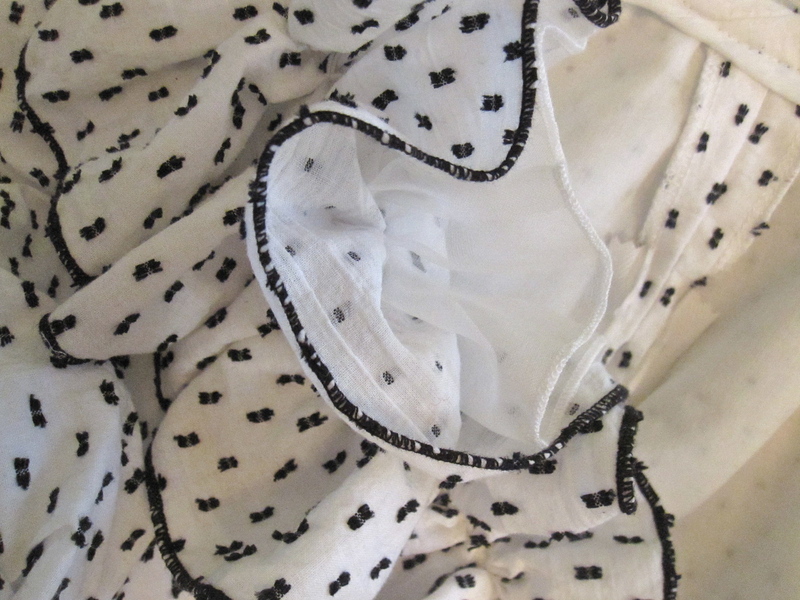 All pieces of the dress are underlined in cotton batiste; the swiss dot is extremely lightweight and sheer. 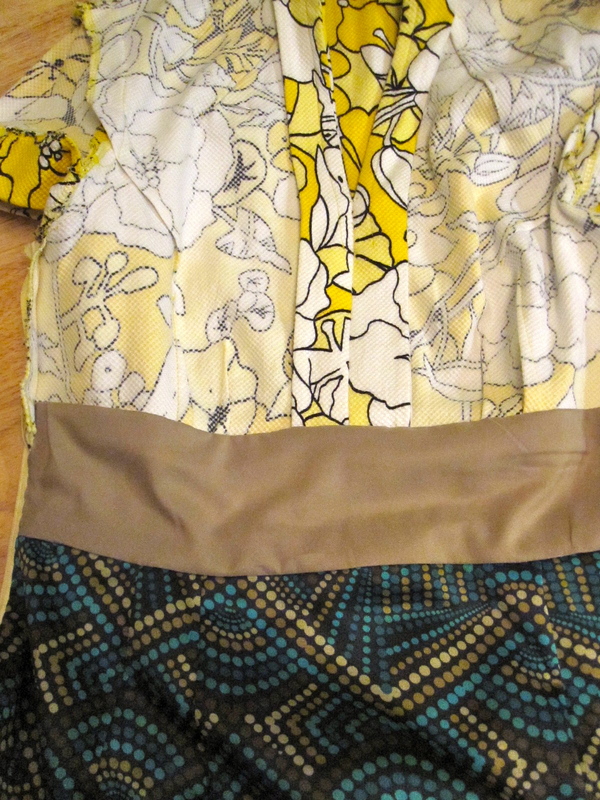 In addition, I lined the midriff and skirt with rayon satin. This is a dress I can see working for Fall with a long sleeved tee underneath, so I wanted to make sure it wouldn't stick to tights. 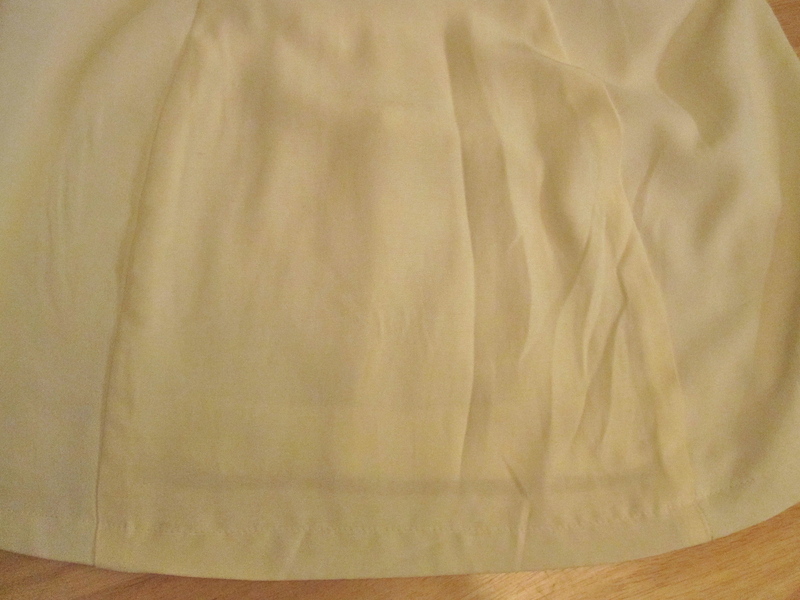 Rather than sew the skirt lining to the midriff lining, I sewed both midriff and skirt lining to the upper seams of their respective pieces. I left the last couple inches of both unsewn on either side of the zipper so that I could stitch them to the zipper tape, rather than having them under the zip tape for more bulk. I admit this is where I ran out of time for my actual birthday. All the public parts of the dress were complete (just barely! 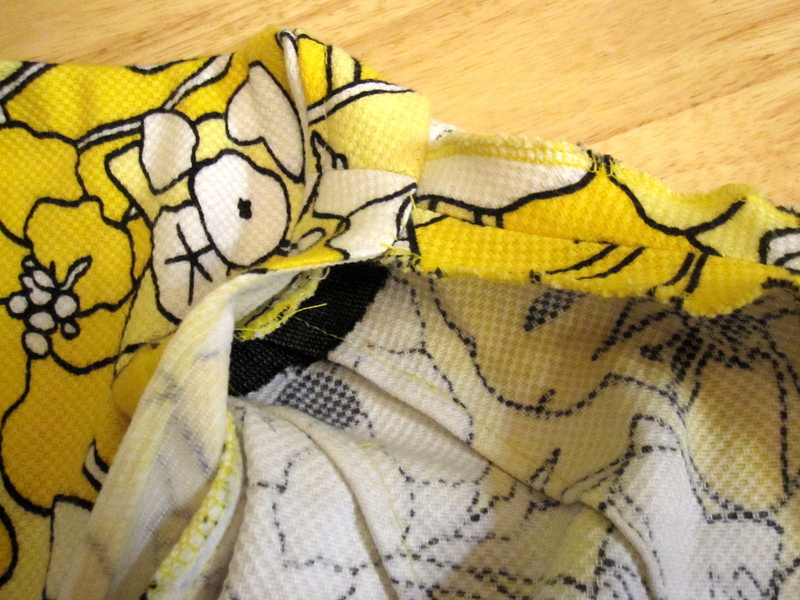 ), but I did not have time to do the hand-stitching to make the inside nice. I took care of that this weekend. The pattern comes in two views: this ruffle neck version, sleeveless, and a neck binding version with a sleeve. Loved the sleeve so I decided to add it to this version. Of course the bodices of the different views are different, and the armscye is not shaped the same. But I was on limited time here and decided to cut out the version I knew and assume I could ease the sleeve into the wrong armhole. In retrospect, it would have been just as easy to correct the neckline on the other version. As it turns out, I didn't have any trouble easing the sleeve into the armscye. However, I cut a size 4 sleeve to match my armscye and really should have cut larger. I had to let out the sleeve's underarm seam to get room for my bicep. It fits, but is noticeable while wearing. My second problem was that I didn't think to do a broad back adjustment. Curses! I don't have any trouble with the first version, but of course it's sleeveless, which gives me the range of motion I need. With the sleeves I definitely need more room across the shoulder blades. I moved the zipper to center back, because I hated the way the zipper coil created a bulge at the side seam in my original version. I sewed the center back seam from the neckline for about 2.5 inches below the neckline seam allowance, so as not to interfere with ruffle application, and then inserted the zip. To give myself as much room across the back as possible, I sewed it with about a 1/4 inch seam allowance (much narrower than the zipper tape). It helped a little. My other change was to raise the neckline 3 inches in cutting just to make sure I had plenty of coverage. I cut two of those inches off after the dress was assembled. My neckline, in addition to being raised, is also slightly narrower at lower center front than the wide U as drafted. I am 1000% more comfortable with the neckline on this one, which does not show my bra. Unfortunately, the expensive matching rose trim I bought for this fabric didn't go with this project, so I'll have to come up with another use for it. But I love everything else about it! It was so fun for a birthday dress. I wore my "tiara" to work and met up with friends for a fabulous outdoor happy hour at Poste after. I got myself the ice cream maker attachment for my Kitchenaid and have already made one batch of ice cream, chocolate peanut butter. Unbelieveable. And I am hoping that my gift from my mom arrives today--you will all be jealous. All in all, a very good birthday this year. The 1st of September is always sad because it means (1) my birthday is over, and (2) the end of summer is near. I am so NOT ready for Fall. Not because I don't like Fall per se, but a short, beautiful Fall is then followed by endless months of cold and sadness. To console myself for the imminent return of cold and sadness, I have my first Fall project picked out. Simplicity has a new line out called "Sew Simple." They are designed to be easy patterns for beginners with minimal details. What they're really doing is getting you used to only having one view per envelope! But kudos to them for updating the pattern envelope artwork. I admit I was sucked in by it and had to get Simplicity 1998. I don't think I will wear it quite that short, but I am picturing it as a great piece for the colorblocking trend, with an obi, brightly colored tights, maybe a turtleneck underneath. I have several gorgeous wools in the turqouise/teal family from The Carol Collection. I chose a deep peacock; for the colors to go with it I'm thinking orange, chartruese, yellow, purple...the possibilities are endless! What is your first project for (*shudder*) Fall?